Background: Night shift workers are more vulnerable to immune-related diseases. Immunoglobulin M (IgM) is a potent activator of complement, and complement has a crucial role in defense against bacterial infections. Circadian type is known as an effective agent on vulnerability and adaptation with shift work due to non-compliance with shift stress. The objective of this study was to investigate the correlation of circadian type and chronic fatigue with the serum concentration of IgM in a group of shift workers. Materials and Methods: This cross-sectional study was performed in an industrial organization in Isfahan, Iran. The study population consisted of 221 male employees working at night shifts who were selected by random cluster sampling. The following questionnaires were used: composite morningness (Torsvall and Akerstedt), circadian type (Folkard), and chronic fatigue (Barton and colleagues). The serum concentration of IgM was measured by the nephelometric method. The data were analyzed with the Pearson coefficient correlation and the path analysis for finding the pattern of the structural equations to evaluate the direct and indirect relationships between variables, using the SPSS 15 and LISREL 8.5 statistical software. Results: Significant correlation was documented between morningness, flexibility, languidness, and chronic fatigue with the serum concentration of IgM (P < 0.01). Conclusion: The results showed that the shift workers with morningness and languidness experienced more problems during the working hours due to more tiredness,and had decreased serum concentration of IgM. Correct management of shift work may attenuate fatigue in workers and also improve many health issues experienced by the shift workers. Because of the effective physiological changes in the circadian cycle, people are categorized into two groups, based on their own activity peak time in the morning and evening. People in morningness group often wake up at sunrise and go to sleep early at night. In contrast, those in eveningness group are awake during the night and are most active late at night. Their performance is undesirable during the day. Morningness type can evaluate three other factors of morning orientation, stable sleep pattern, and strength and power. People who are more flexible in stable sleep pattern and gain a high score of power have less damage caused by shift working than that experienced by others. Personality traits are associated with chronic fatigue, such as flexibility, vitality, and eveningness, and predict the physical and psychological problems. Therefore, night shift working affects the immune response components, and it seems that the circadian type of sleeping for working at the night shift may affect IgM change through fatigue by significant fluctuations in the biological rhythms of hormones. This study aimed to investigate the correlation of circadian type and chronic fatigue due to shift work with the serum concentration of IgM. This cross-sectional study was conducted among male night shift workers in one of the industrial organizations of Isfahan, the second large city of Iran. They had to stay awake at night for work. Participants were selected by random cluster sampling; firstly, four industrial divisions were chosen among all the divisions, which were engaged at night shift work. Subsequently, 221 healthy workers were selected from these four divisions, based on the community size. The sample size was calculated, based on the Krejcie and Morgan criteria, considering the permissible error of 5%, the confidence level of 95% and the standard deviation of the current variable in the community. Written informed consent was obtained from all workers to contribute to this study and the study protocol conformed to the ethical guidelines of the 1975 Declaration of Helsinki, as reflected in a prior approval by the institution's human research committee. All workers were notified of their assay results. Workers were not included if they had chronic physical and mental illnesses according to the medical records of the Department of Industrial Medicine in the previous 6 months, or if they had used any medication that could have influenced the immune system (e.g. medications for hypersensitivity or rheumatologic disorders). In addition, smokers, those with hypertension, or those who participated in a working environment with more than 60 db continuous sound, or reported upper respiratory tract infection on the day of the visit, were not included either. Questionnaires were used in order to measure the variables related to circadian type in the two components of morningness and eveningness and chronic fatigue. The divisions were similar in terms of work rigidity, and workers worked in the technical division. It consisted of 13 questions for the evaluating the individuals' circadian type. This questionnaire was introduced by Torsvall and Akerstedt in 1980 to assess the circadian type. It assesses three aspects of sleep time (morningness, eveningness, and moderate). Scores of less than 22 indicate eveningness type, between 23 and 43 represent the moderate type, and scores above 44 indicate morningness type. The reliability coefficient obtained using Cronbach's alpha was equal to 0.91. The inventory consists of 30 questions and has two subscales of languidness/vigorousness and flexibility/rigidity. The reliability coefficients calculated using Cronbach's alpha were equal to 0.79 for the first factor and 0.83 for the second factor, respectively. Blood samples were collected in vacutainer serum isolation test tubes at the end of the work shift. The samples were retained at room temperature for 30 min and then analyzed by the laboratory of the Industrial, Medicine Unit of the organization. Moreover, the workers were requested to refrain from smoking before the blood samples were obtained. Forty microliters of blood sample was added to 400 μl of diluents (Minineph IgM buffer, Minineph human IgM kit, product code: ZK012.R, the approximate measuring range is 0.25-4.00 g/l) in a sample dilution tube (1/11 dilution). Subsequently, 40 μl of Minineph human IgM antiserum was added to the mixture, which was finally placed in the instrument for IgM assay. Controls of same dilution (1/11) using the same diluents were also prepared for accuracy. The samples were analyzed by the nephelometry method (using the Behring nephelometer), based on light scattering after 180 s. Actual and quantitative concentrations of serum IgM are shown in [Table 1]. Data were analyzed using the Pearson correlation coefficient and path analysis for the structural equation modeling in Statistical Package for Social Sciences (SPSS) version 15.0 (SPSS Inc., Chicago, IL, USA) and LISREL 8.5 (analysis of linear structural relationships) software. The proposed model provided for the path analysis of the variables is depicted in [Figure 1]. The obtained standardized coefficients are shown in this model. The mean and standard deviation (SD) of the age of the workers were 35.4 ± 2.49 (range 29-42) years. [Table 1] displays the descriptive indicators and correlations between the variables. It presents significant correlations of the serum IgM concentration with morningness (r = −0.601), flexibility (r = 0.379), and chronic fatigue (r = −0.493), respectively (P < 0.01). [Table 2] and [Figure 1] display three model variables of morningness, languidness, and flexibility, which had indirect influence on the serum IgM concentration in three pathways through chronic fatigue. Among the three variables, morningness and flexibility had direct impact on the serum IgM concentration. The depicted model had the favorable conditions concerning fitting and fit indices. The Chi-square was equal to 1.56 and was significant (P < 0.05). On the other hand, Adjusted of fit good index =0.97, Goodness of fit Index =0.94, and Root mean squares error approximation =0.03. For the indexes related to AGFI and GFI, values ​​higher than 0.9, and for the RMSEA, values lower than 0.06 have been reported favorable. Thus, by considering the values ​​of model parameters, it could be pointed out that the final model was an appropriate fit with the research data. [Table 2] shows that morningness, chronic fatigue, and flexibility provide 42% of the IgM variance. In addition, morningness, flexibility, and languidness show 38% of the chronic fatigue variance. However, the standard coefficients are significantly representative of all the indirect effects for the final model. The results of this study also show that the indirect effects of morningness, flexibility, and languidness on chronic fatigue are significant at a level of 0.01%. [Table 3] shows that the standardized coefficients confirmed the statistical significance of all indirect effects for the final model. 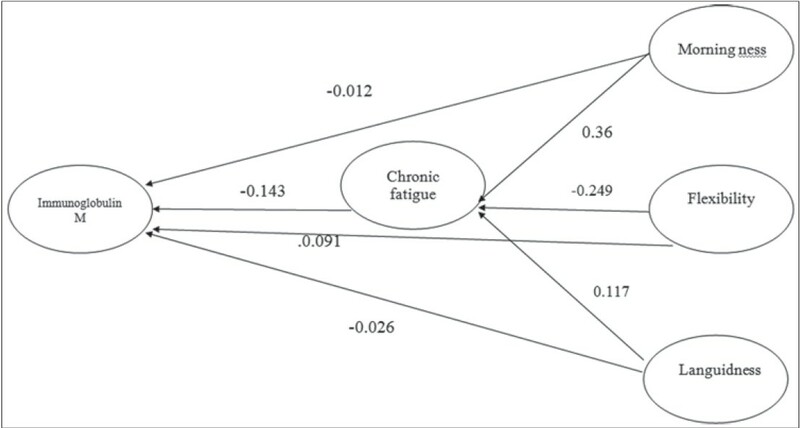 According to the survey data, most likely, the indirect effects of morningness, flexibility, and languidness through chronic fatigue were significant (P < 0.01). This study suggests that the types of morningness, flexible, and languidness influence the serum concentration of IgM through the chronic fatigue. The morningness and languidness groups were facing more problems during night shifts due to failure of the immune system function. The model presented in this research highlights the importance of health promotion of the night shifts and proper selection of the shift workers. Thus, it is suggested to check other personality factors in order to provide the standard model for shift working. We are very grateful to Mr. Ali Saffaei from the Pharmacy Students' Research Committee, School of Pharmacy, Isfahan University of Medical Sciences, for his invaluable technical aids. British Medical Association. Shift Patterns Must Improve: Minimizing the Risks. 2010. Available from: http://www.bma.org.uk/images/shiftwork_tcm26-196305.pdf. [Last accessed on 2013 Jun 2]. Pévet P. Melatonin and biological rhythms. Biol Signals Recept 2000;9:203-12. Folkard S. Do permanent night workers show circadian adjustment? A review based on the endogenous melatonin rhythm. Chronobiol Int 2008;25:215-24. Reinberg A, Ashkenazi I. Internal desynchronization of circadian rhythms and tolerance to shift work. Chronobiol Int 2008;25:625-43. Spurgeon A, Harrington JM, Cooper CL. Health and safety problems associated with long working hours: A review of the current position. Occup Environ Med 1997;54:367-75. Knutsson A. Health disorders of shift workers. Occup Med (Lond) 2003;53:103-8. Swaab DF, Slob AK, Houtsmuller EJ, Brand T, Zhou JN. Increased number of vasopressin neurons in the suprachiasmatic nucleus (SCN) of ′bisexual′ adult male rats following perinatal treatment with the aromatase blocker ATD. Brain Res Dev Brain Res 1995;85:273-9. Jerjes WK, Cleare AJ, Wessely S, Wood PJ, Taylor NF. Diurnal patterns of salivary cortisol and cortisone output in chronic fatigue syndrome. J Affect Disord 2005;87:299-304. Prather AA, Marsland AL, Hall M, Neumann SA, Muldoon MF, Manuck SB. Normative variation in self-reported sleep quality and sleep debt is associated with stimulated pro-inflammatory cytokine production. Biol Psychol 2009;82:12-7. Takahashi M, Tanigawa T, Tachibana N, Mutou K, Kage Y, Smith L, et al. Modifying effects of perceived adaptation to shift work on health, wellbeing, and alertness on the job among nuclear power plant operators. Ind Health 2005;43:171-8. Copertaro A, Bracci M, Barbaresi M, Santarelli L. Assessment of cardiovascular risk in shift healthcare workers. Eur J Cardiovasc Prev Rehabil 2008;15:224-9. Nagai M, Morikawa Y, Kitaoka K, Nakamura K, Sakurai M, Nishijo M, et al. Effects of fatigue on immune function in nurses performing shift work. J Occup Health 2011;53:312-9. Godbout JP, Glaser R. Stress-induced immune dysregulation: Implications for wound healing, infectious disease and cancer. J Neuroimmune Pharmacol 2006;1:421-7. Carrillo-Vico A, Guerrero JM, Lardone PJ, Reiter RJ. A review of the multiple actions of melatonin on the immune system. Endocrine 2005;27:189-200. Ravetch J, Bolland S. IgG Fc receptors. Annu Rev Immunol 2001;19:275-90. Anderson BL. Cancer. In: Friedman HS, editors. Encyclopedia of Mental Health. San Diego: Academic Press; 1998. p. 373-8. Goodkin K, Visser AP. Psychoneuroimmunology: Stress, Mental Disorders, and Health. 1 st ed. Washington, DC: American Psychiatric Publishing; 2000. p. 211- 216. Segerstrom SC, Miller GF. Psychological stress and the human immune system: A meta-analytic study of 30 years of inguriy. Psychol Bull 2004;130:601-30. Ciaccio C. B cell activation and antibody production. In: Abbas AK, Lichtman AH, Pillai S, editors. Cellular and Molecular Immunology. Philadelphia: WB Elsevier Saunders Company; 2012. p. 243-68. Casale G, Marinoni GL, d′Angelo R, de Nicola P. Circadian rhythm of immunoglobulins in aged persons. Age Ageing 1983;12:81-5. Copertaro A, Bracci M, Gesuita R, Carle F, Amati M, Baldassari M, et al. Influence of shift-work on selected immune variables in nurses. Ind Health 2011;49:597-604. Härmä M. Circadian adaptation to shift work. A review. In: Hornberger S, Knauth P, Costa G, Folkard S, editors. Shift Work in the 21 st Century. Frankfurt: Peter Lang; 2000. p. 125-30. Adan A, Fabbri M, Natale V, Prat B. Sleep beliefs scale (SBS) and circadian typology. J Sleep Res 2006;15:125-32. Folkard S, Monk TH, Lobban MC. Short and long-term adjustment of circadian rhythms in ′permanent′ night nurses. Ergonomics 1978;21:785-99. Smith CS, Folkard S, Schmieder RA, Parra LF, Spelten E, Almiral H, et al. Investigation of morning-evening orientation in six countries using the preferences scale. Pers Individ Dif 2002;32:949-68. Cohen L, Manion L, Morrison K. Research Methods in Education. 5th ed. London: Routledge; 2000. p. 211. Barton J, Spelten E, Totterdell P, Smith LR, Folkard S, Costa G. The standard shiftwork index: A battery of questionnaires for assessing shift work-related problems. Work Stress 1995;9:3-30. Steinman L. Elaborate interactions between the immune and nervous systems. Nat Immunol 2004;5:575-81. Díaz-Morales JF. Morning and evening-types: Exploring their personality styles. Pers Individ Dif 2007;43:769-78. Mitchell PJ, Radman JR. The relationship between morningness-eveningness, personality and habitual caffeine consumption. Pers Individ Dif 1993;15:105-8.
van Mark A, Weiler SW, Schröder M, Otto A, Jauch-Chara K, Groneberg DA, et al. The impact of shift work induced chronic circadian disruption on IL-6 and TNF-alpha immune responses. J Occup Med Toxicol 2010;5:18. Shakhar K, Valdimarsdottir HB, Guevarra JS, Bovbjerg DH. Sleep, fatigue, and NK cell activity in healthy volunteers: Significant relationships revealed by within subject analyses. Brain Behav Immun 2007;21:180-4. Ader R, Cohen N, Felten D. Psychoneuroimmunology: Interactions between the nervous system and the immune system. Lancet 1995;345:99-103. Ziemssen T, Kern S. Psychoneuroimmunology--cross-talk between the immune and nervous systems. J Neurol 2007;254(Suppl 2):II8-11. Matchock RL, Mordkoff JT. Chronotype and time-of-day influences on the alerting, orienting, and executive components of attention. Exp Brain Res 2009;192:189-8. Richardson G, Tate B. Hormonal and pharmacological manipulation of circadian clock: Recent developments and future strategies. Sleep 2000;23 Suppl 3:S77-85. Arushanian EB, Baĭda OA, Mastiagin SS, Popov AV. Significance of chronotypic specificity of healthy individuals for the variability of cardiac rhythm. Fiziol Cheloveka 2006;32:80-3. Khaleghipour S, Masjedi M, Ahadi H, Enayate M, Pasha G, Nadery F, et al. Morning and nocturnal serum melatonin rhythm levels in patients with major depressive disorder: An analytical cross-sectional study. Sao Paulo Med J 2012;130:167-72.